In today’s blog I complete my look at the 16th century Italian painter, Giovanni Battista Moroni, and look at some of his religious works. Moroni had studied under Alessandro Bonvicino (Il Moretto) and in the 1540’s he eventually rose to become the main studio assistant at his Master’s Brescia workshop. Moroni went on to ply his trade in Bergamo, his home town of Albino and the town of Trent during which time, the town hosted the Catholic ecumenical Council of Trent. The first Council being held between 1546 and 1548 and Pope Julius III instigated the Second Council of Trent, which began in May1551 and ended two years later. 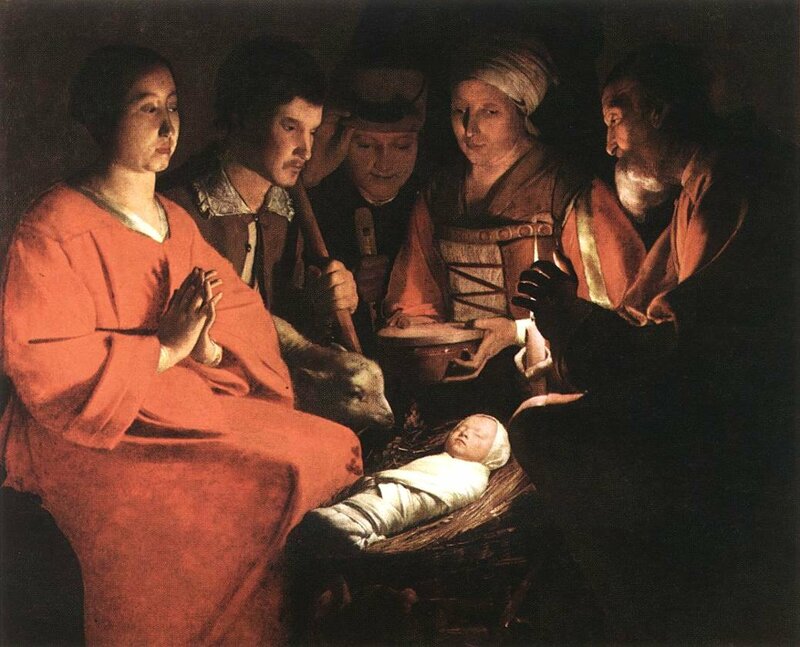 During these days Moroni received many commissions to paint altarpieces for the local churches. 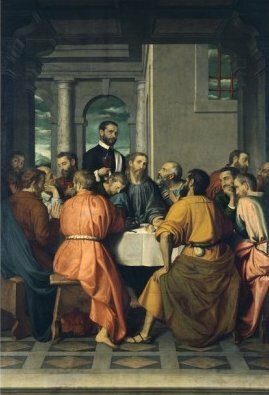 One such religious work was The Last Supper which Moroni completed in 1569. The setting for the work is a covered logia, which is part of an architectural setting through which we glance out at a distant blue-skied landscape. 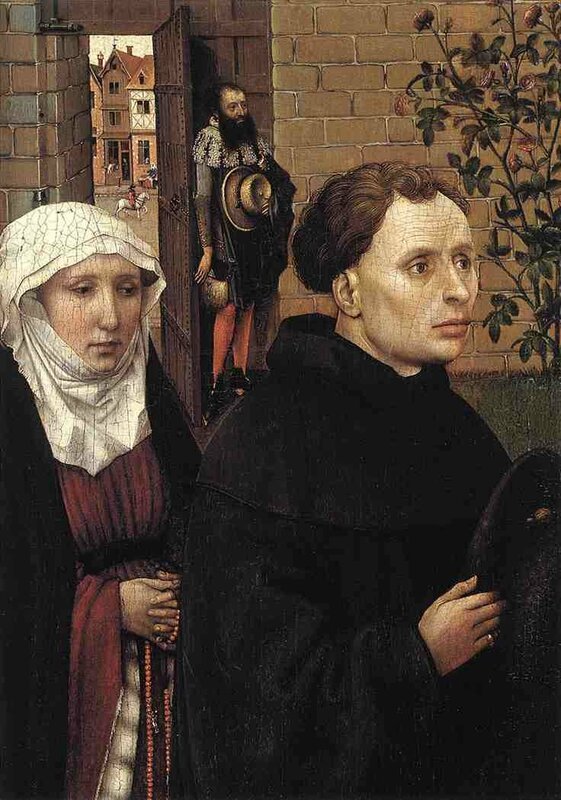 The first thing that strikes you about this rendition of the famous religious scene is the man in black who stands behind those partaking in the meal. We can tell by his dress that he is not one of the Apostles. He stands behind St John and is acting as a waiter to the diners. 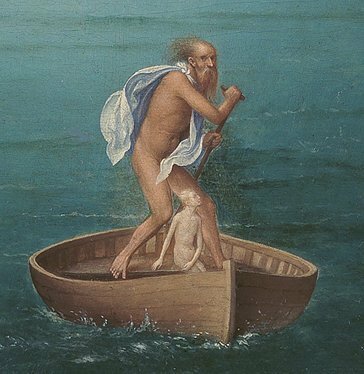 He is the dominant character in the painting but why was he included? 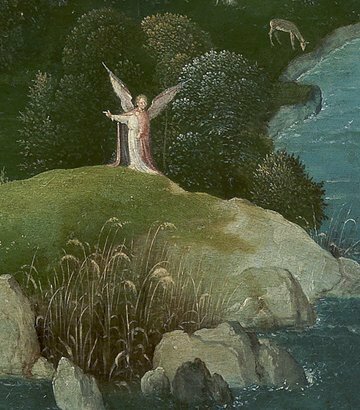 We know the painting was commissioned in December 1565 by the Confraternita del Santissimo Sacramento, a regional Brotherhood of the Blessed Sacrament in the small Bergamo commune of Romano di Lombardia and was not completed until 1569. There has been much speculation about the identity of the man in black with some people, such as the 19th century Italian art historian, Milesi Locatelli, who in his 1869 three-volume biography Illustri Bergamaschi. Studi critic-biografici, and more recently Maria Calì in her 1980 book, “Verita” e “religione” nella pittura di Giovan Battista Moroni, both stated that it was the artist himself but why the confraternity would want Moroni to include himself is hard to rationalize. 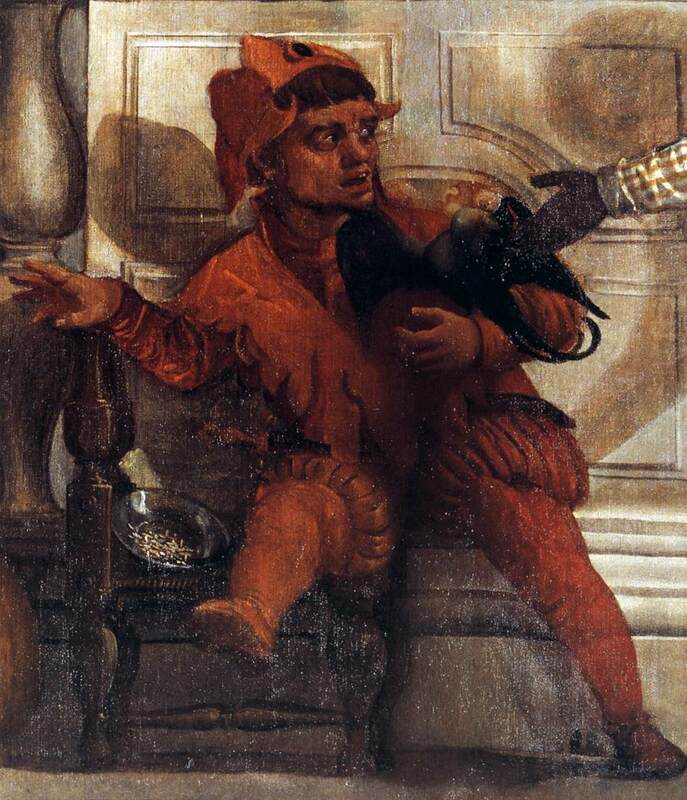 Simone Facchinetti who co-wrote the book which accompanies the Royal Academy’s Moroni exhibition believes that the man in black is Lattanzio da Lallio, the parish priest of the Romano di Lombardia church at the time of the painting and his position of power over the confraternity and the fact that he was arranging the painting commission with Moroni, may have allowed/asked the artist to have himself depicted in the painting. My next couple of religious works by Moroni are very interesting. 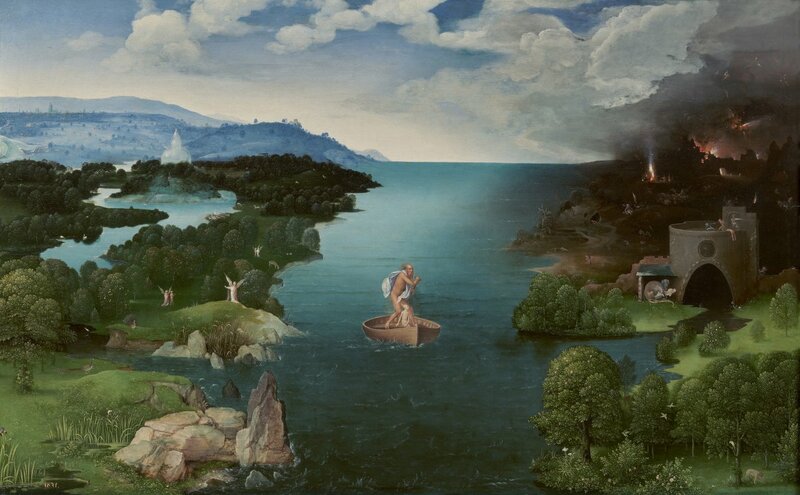 The depiction in each case is believed to have come from what was taught by Saint Ignatius of Loyola in his Spiritual Exercises, often termed the Ignatian Spirituality. The Spiritual Exercises are a compilation of meditation, prayer, and contemplative practice developed by St. Ignatius Loyola to help people deepen their relationship with God. 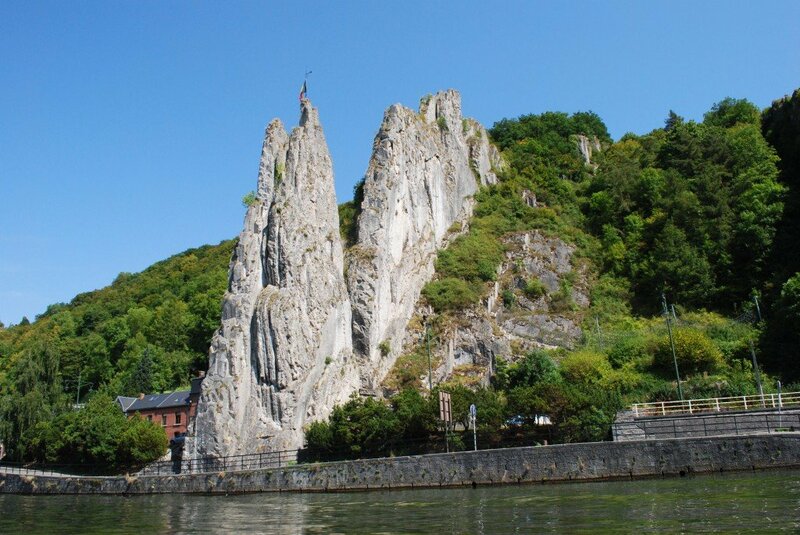 They were a set of Christian meditations, prayers and mental exercises. When one prayed, St Ignatius believed that one should meditate on a biblical passage so as to bring the person praying closer to God. 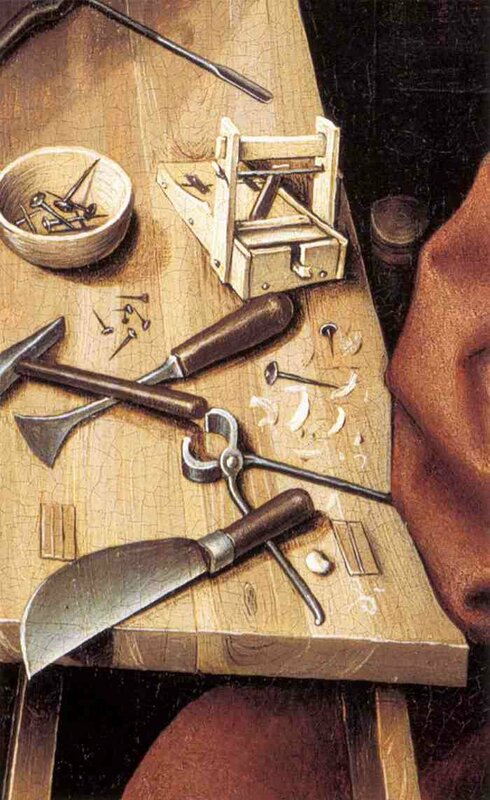 He gave precise instructions on the matter of composition or envisioning the place. The religious composition is the fruit of mental prayer. It is a sort of vision arising in the mind of the one who is praying. It is seeing with the eyes of the imagination a physical location in which the thing the worshipper wishes to contemplate is to be found. 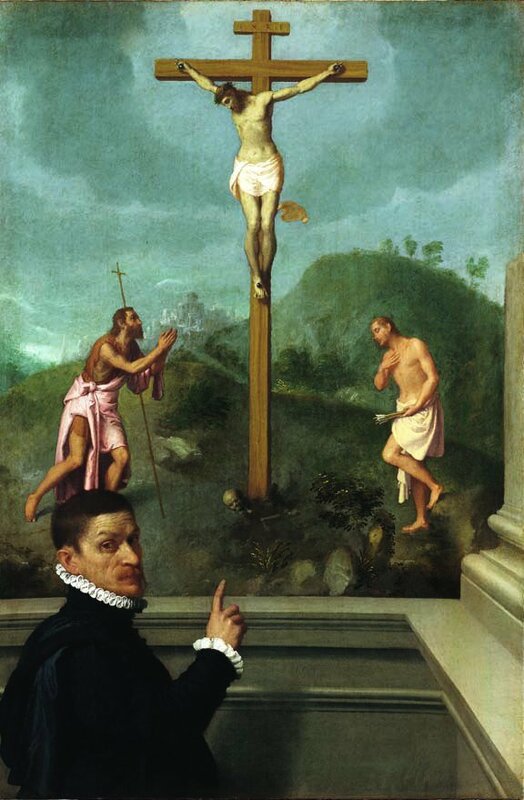 The first painting is entitled A Man in Contemplation Before the Crucifixion with St John the Baptist and St. Sebastian which was completed by Giovanni Battista Moroni around 1575. The painting is housed in the Bergamo church, Chiesa di Sant’ Alessandro della Croce. 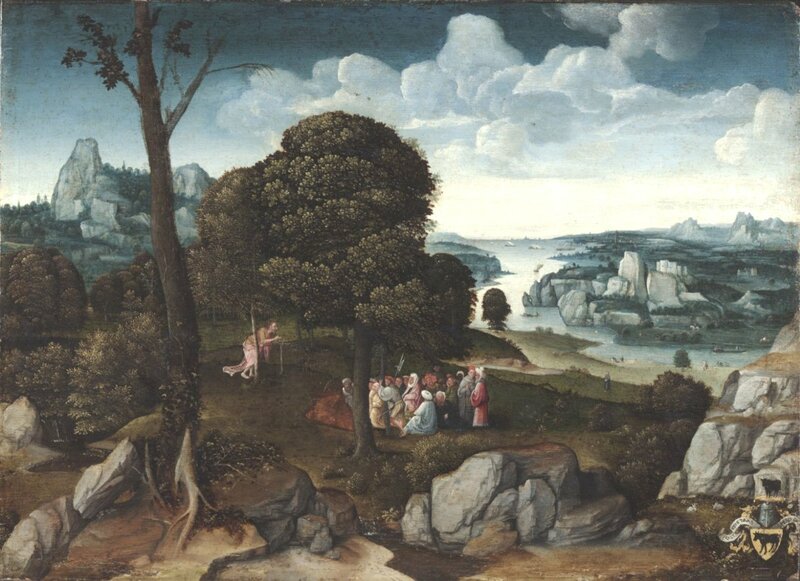 In this work a man in the foreground has turned towards us and points towards a painted scene of the Crucifixion which is being witnessed by St John the Baptist on the left and St Sebastian on the right. The latter can be seen holding the arrows shot at him during the first attempt on his life. 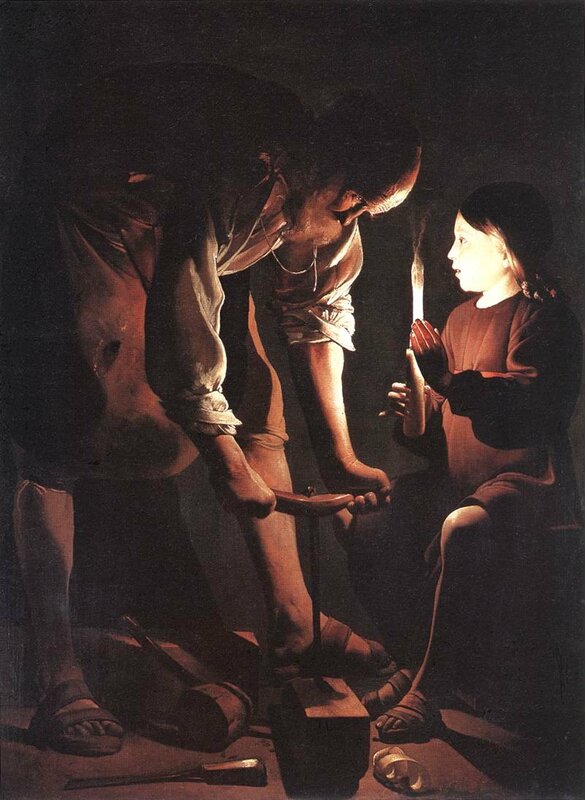 Sebastian is often depicted in paintings tied to a tree or a pillar and shot with arrows but according to legend he did not die and was rescued by Irene of Rome, later Saint Irene. Later, around AD 288, he was clubbed to death for openly criticising the Roman Emperor Diocletian. 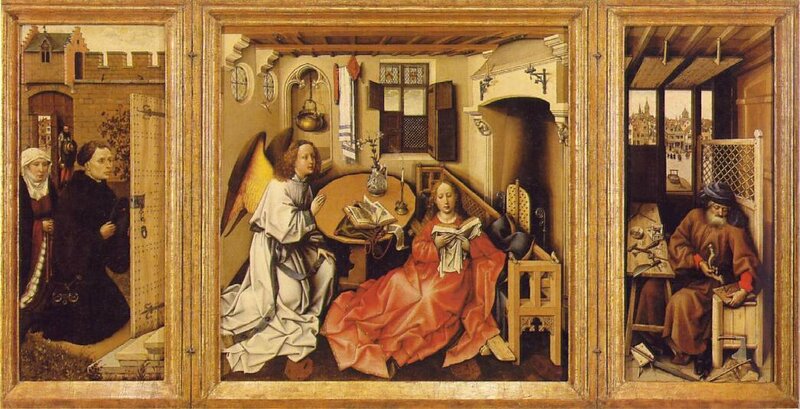 The second work depicts a man praying and at the same time concentrating his mind on a story from the Bible, which in this case is the baptism of Christ by St John. What we see before us is what, through deep meditation, the praying man has conjured up in his mind during prayer. 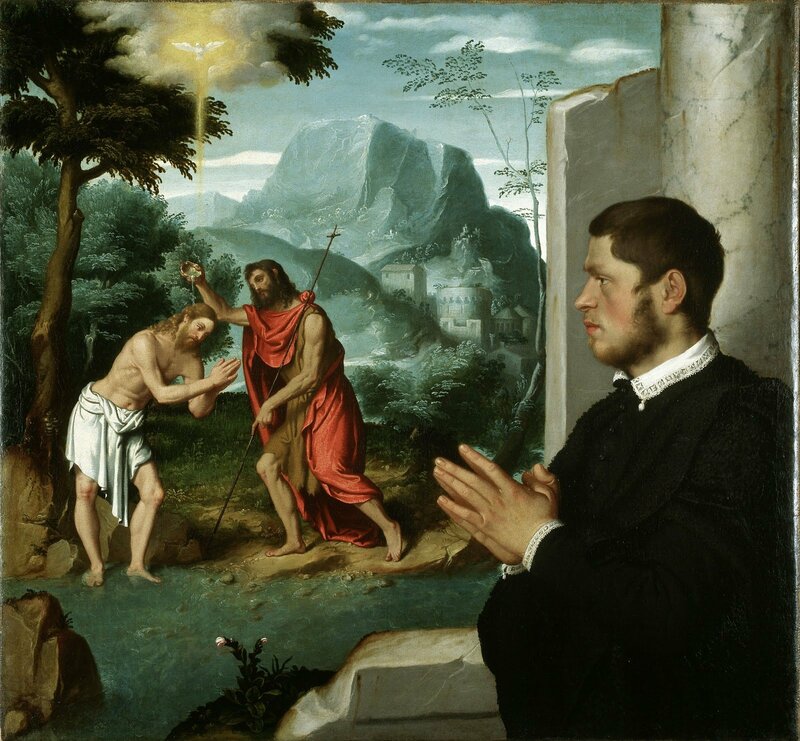 The painting is entitled Gentleman in Contemplation of the Baptism of Christ which Moroni completed around 1555. 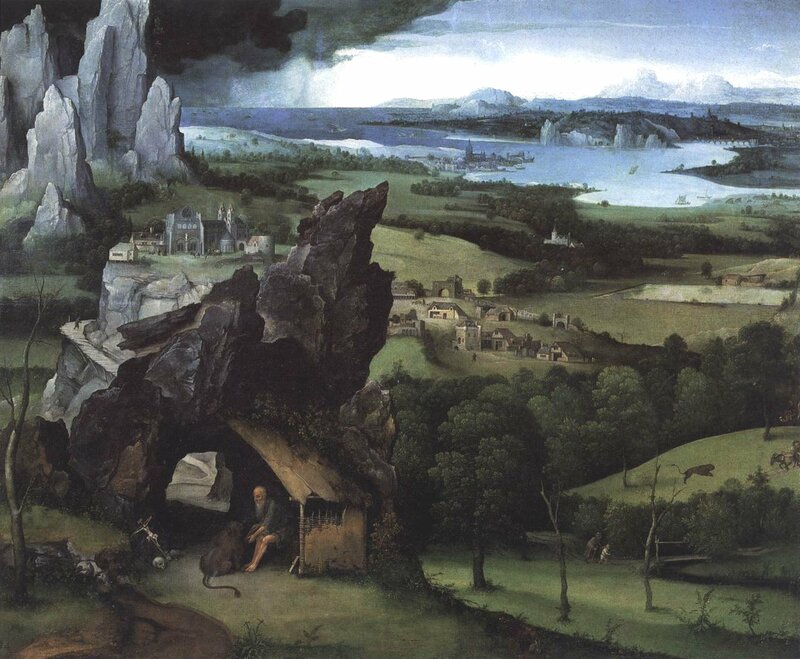 The young man, with his hands clasped in prayer, stands upright before the biblical scene he is imagining, separated from it by some architectural ruins. 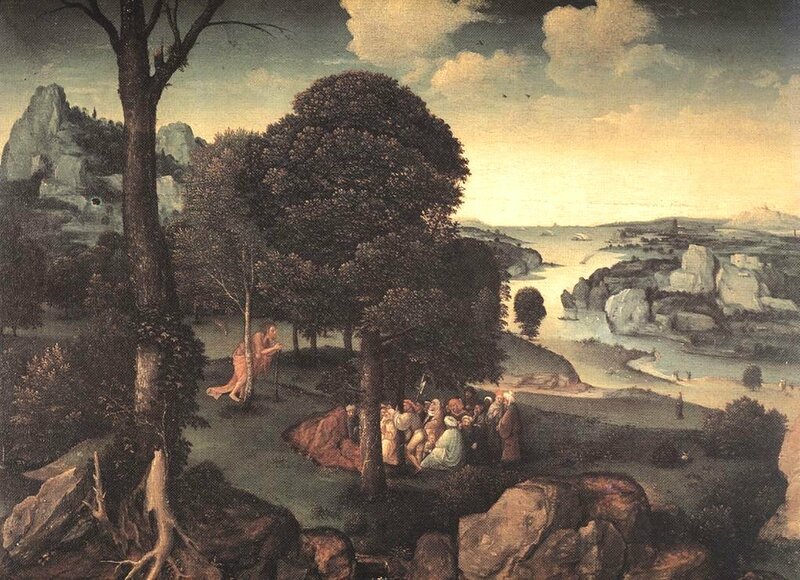 In the background we have a Lombardy landscape and in the middle ground we see the two figures by a stream which almost certainly alludes to the River Jordan where Christ was baptised by John. 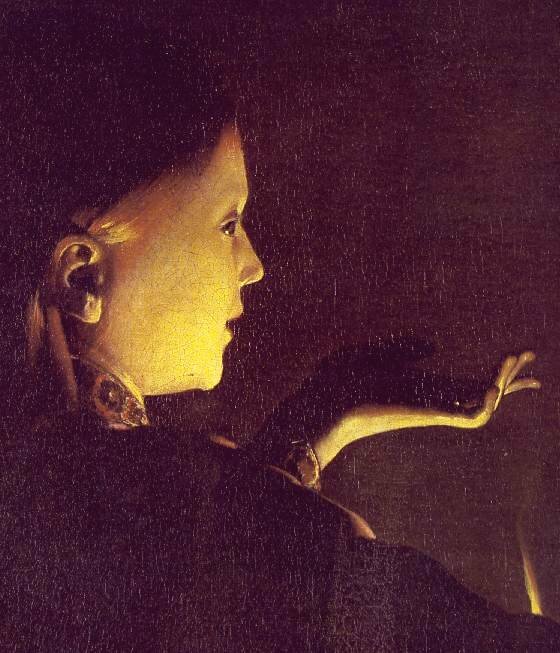 The painting is now part of the Gerolamo and Roberta Etro collection. Gerolamo, an avid art collector, was the founder in 1968 of Etro the Italian luxury fashion house. 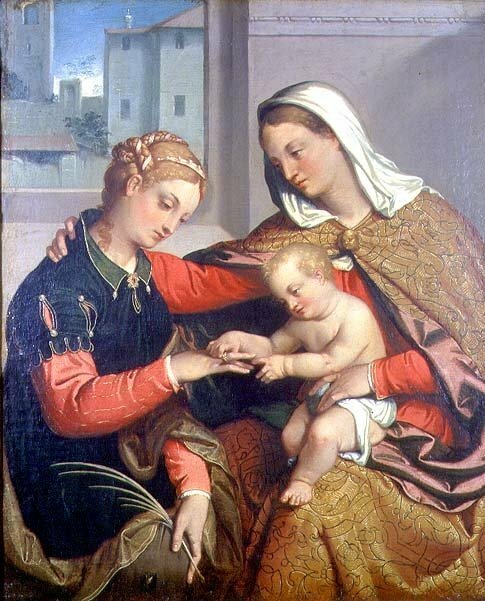 My final offering of a religious work by Moroni is The Mystic Marriage of St. Catherine and was completed around 1550. 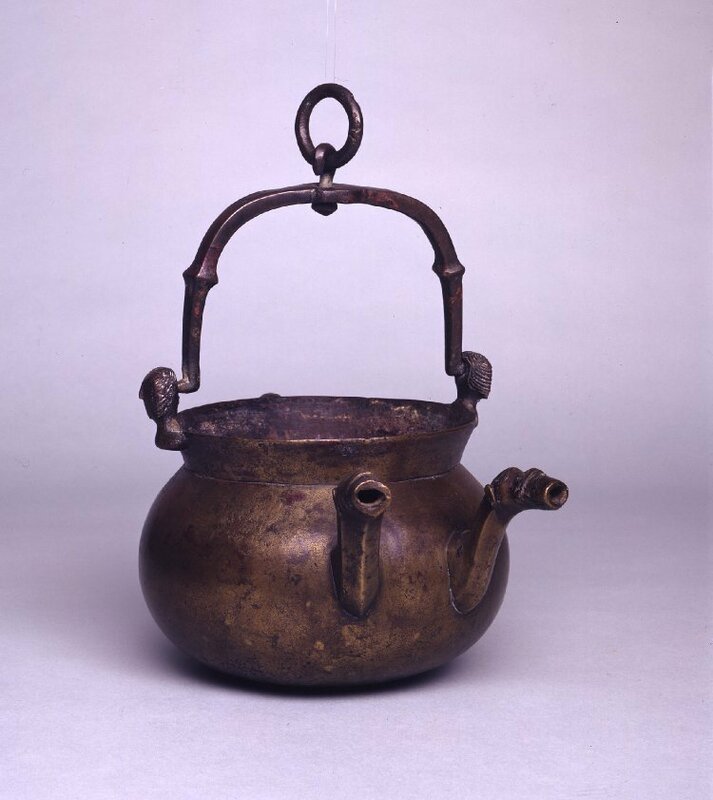 It is a beautiful and delicate work of art and is housed at the Ashmoleon Museum in Oxford. 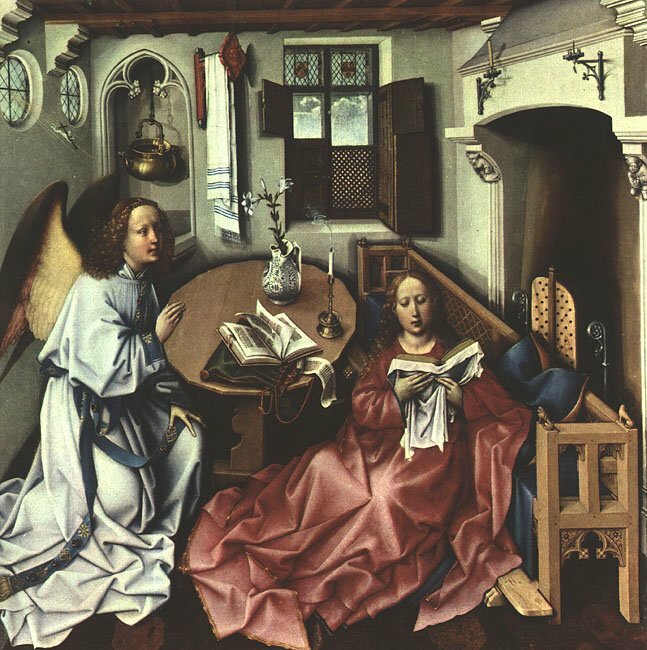 In the painting we see a depiction of St Catherine, an early Christian martyr of royal birth, seated next to the Virgin Mary, who cradles the Christ Child. 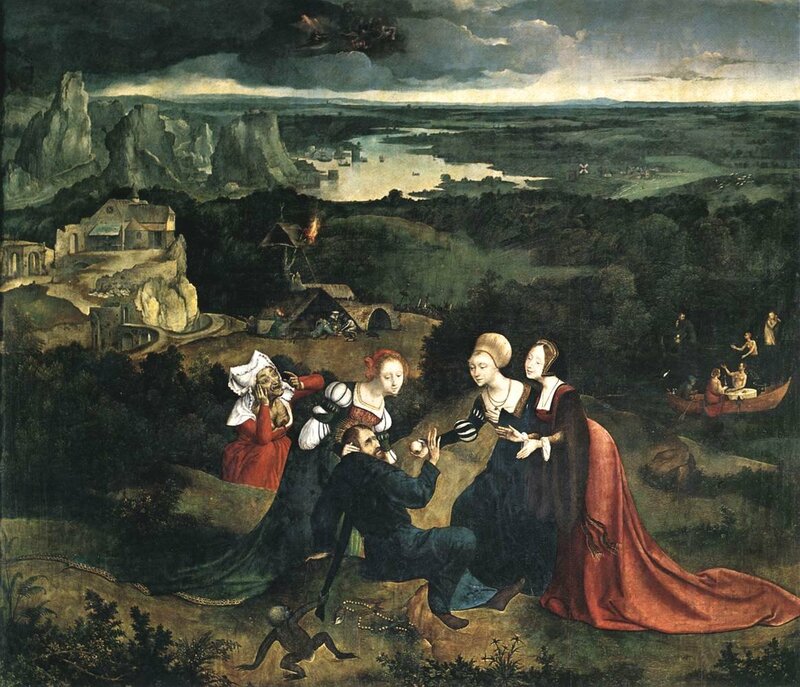 Catherine is receiving a wedding-ring from Him, which symbolises her spiritual closeness to God. In her left hand she holds a palm frond which was adopted into Christian iconography to represent the victory of martyrs, a victory for the faithful against those who want to claim their soul. 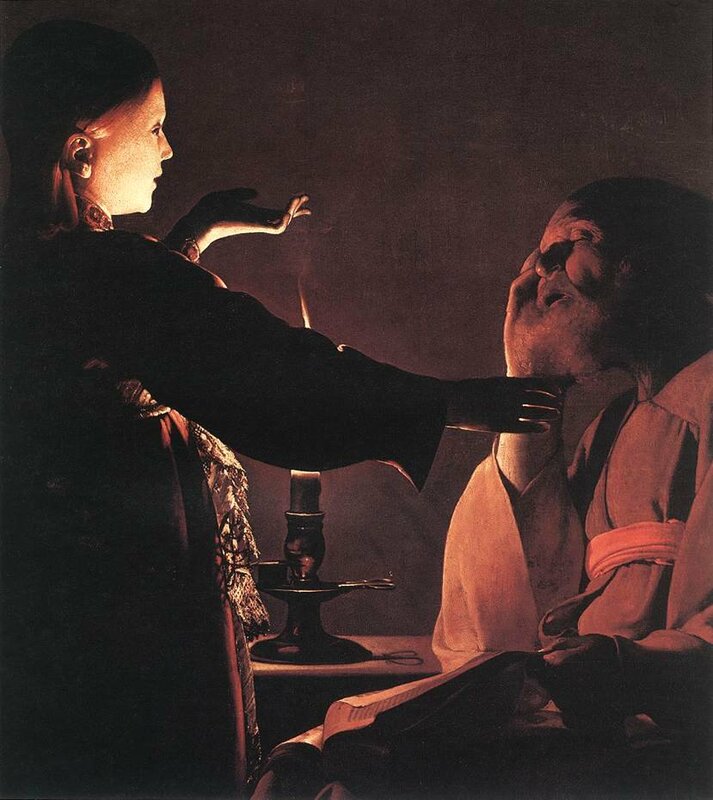 St Catherine, who died in Alexandria, Egypt, in the early 4th century AD, when she was in her twenties. 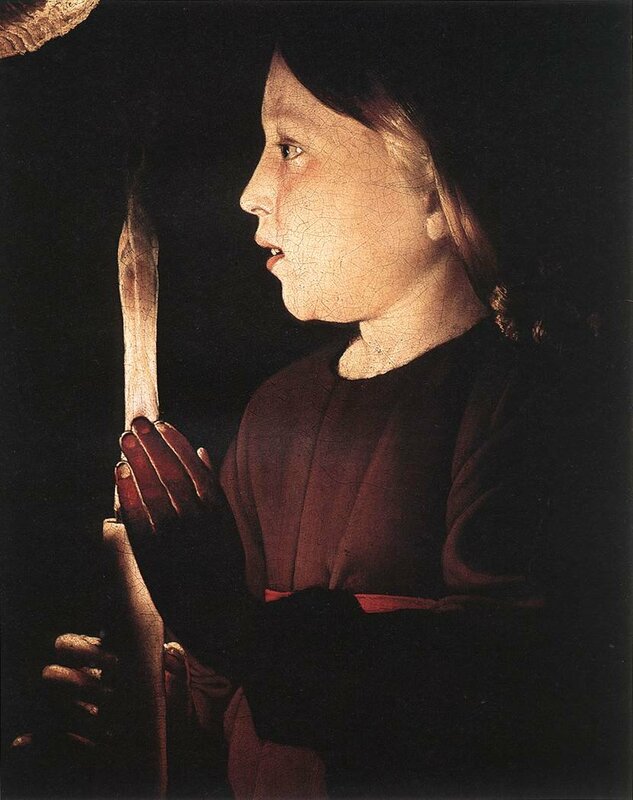 She was martyred at the hands of the pagan emperor Maxentius. 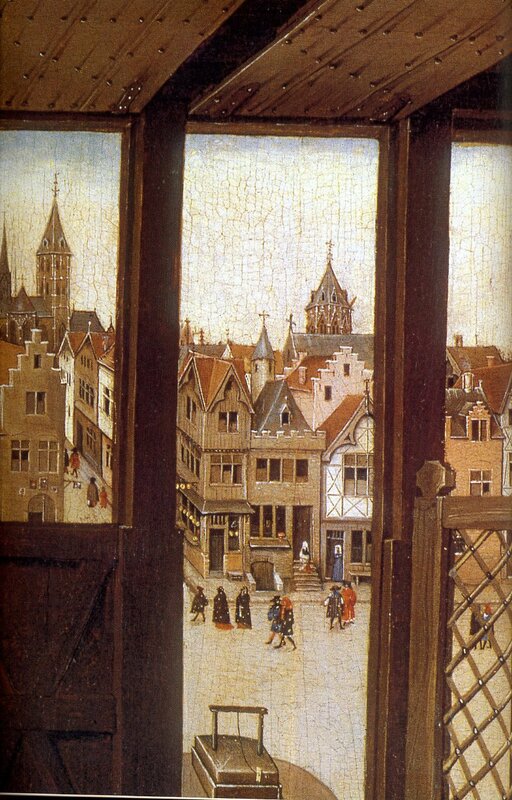 The setting for the painting is inside a room, which has a large window, through which can be seen a town. 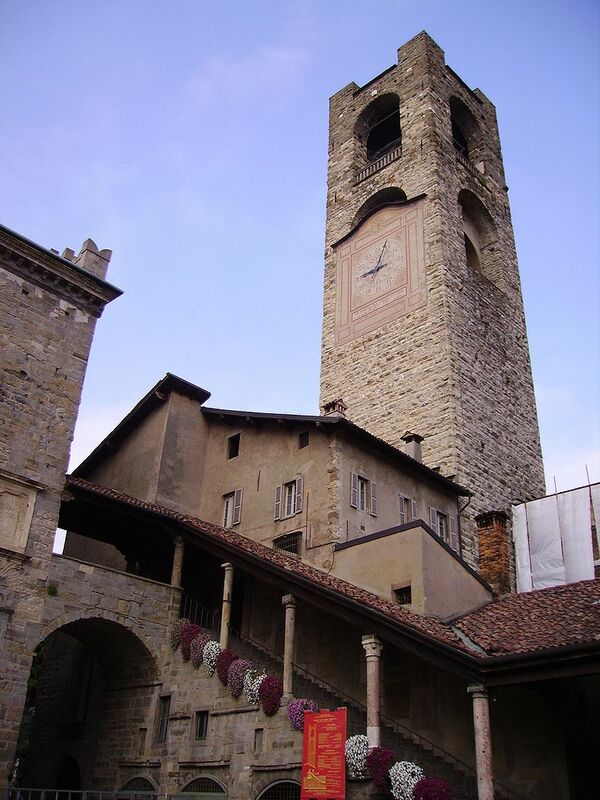 It is thought that it is the town of Bergamo, as to the left, one sees the town’s Torre Civica, which was built in the twelfth century. The small oil on canvas painting, which measures 86cms x 68cms, is thought to have been designed for private devotion. 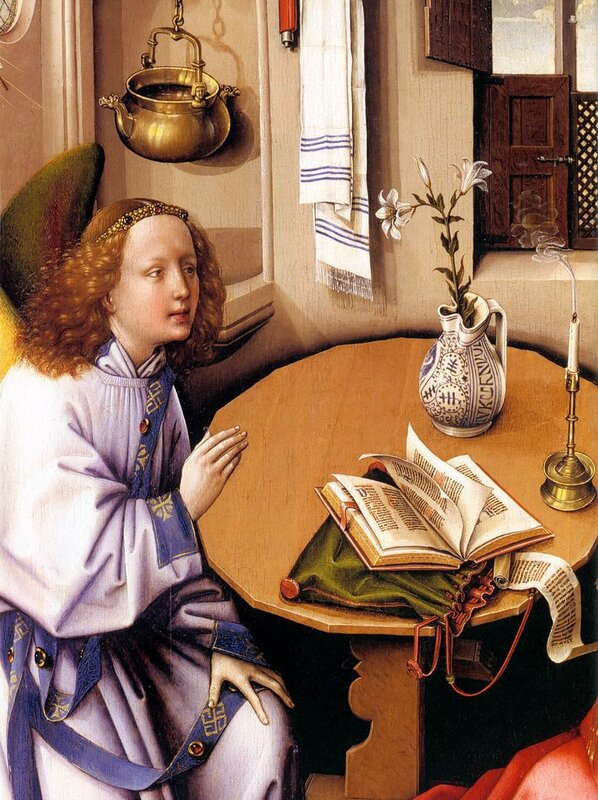 Furthermore the original recipient of the work is thought to have been a young girl, who would then identify herself with the teenage martyr, Catherine. Giovanni Moroni was part way through a commission to paint The Last Judgement in the church at Gorlago, a commune of Bergamo, close to his home town of Albino. He never completed the commission as he died in February 1579. 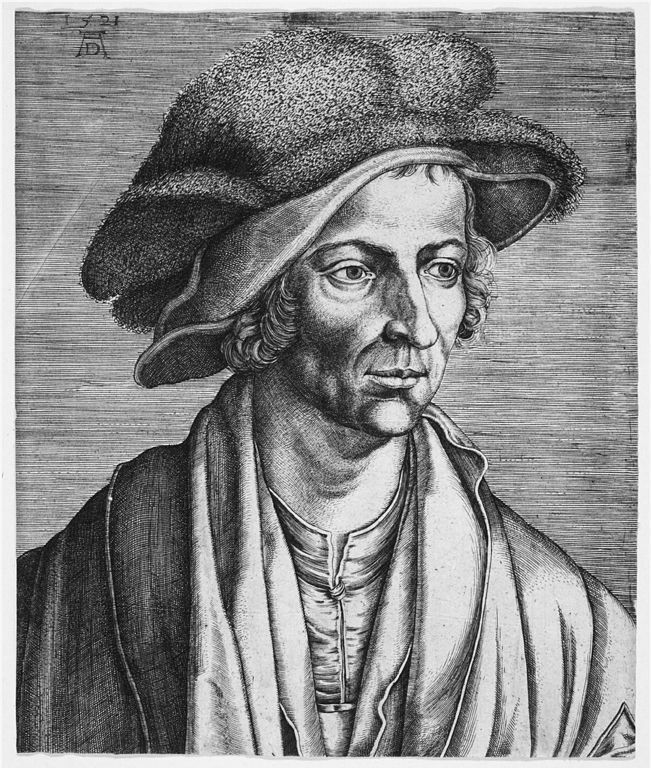 Although his exact birth date is not known it is reckoned he was in his mid-fifties when he died. The 16th century the art scene of Venice was dominated by three artists, Titian, Paolo Veronese, and Jacopo Tintoretto and it was these three painters who managed to tender for and win most of the public and religious commissions, which were on offer during that period. 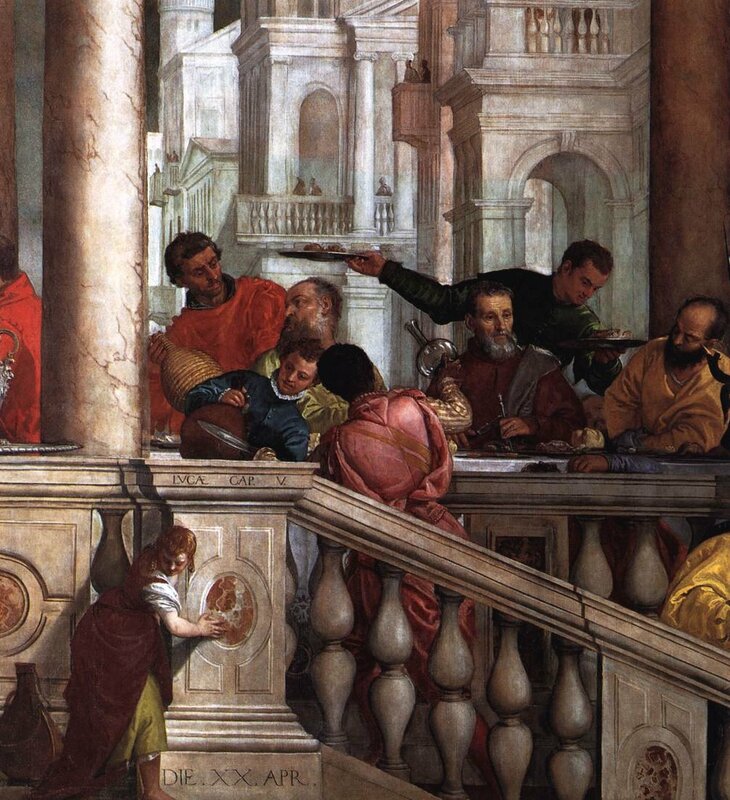 My featured painting today was one of Veronese’s most controversial paintings. It was intended to be a monumental work depicting the Last Supper but as you will now read that Veronese, three months after its completion, had to hastily change the title of the painting. The work, which is now entitled Feast at the House of Levi, is a massive work of art measuring 555cms x 1280cms (18’6″ x 42’6″) and was far too big to be included in the recent Veronese Exhibition at the National Gallery, London but I have been fortunate enough to stand in front of this amazing work a few years ago when I visited the Gallerie dell’Accademia in Venice. It is a truly magnificent painting. In 1573, Paolo Veronese, who was at the time forty-five years old, was awarded the commission to paint a depiction of the Last Supper for the rear wall of the refectory of the fourteenth century Basilica di Santi Giovanni e Paolo, sometimes known as the pantheon of doges, as twenty-five of them have been buried there. 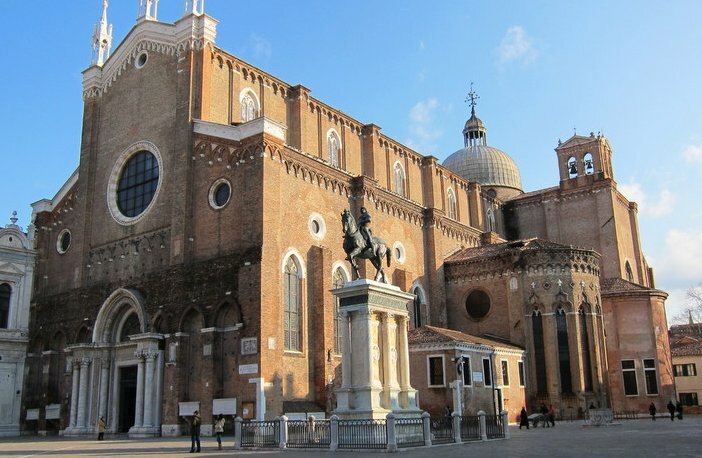 It is one of the largest churches in the city of Venice. The building of this great church started around 1333 but was not completed until November 1430 as the construction was halted on many occasions due to the never-ending plagues that the city suffered during the 14th century. 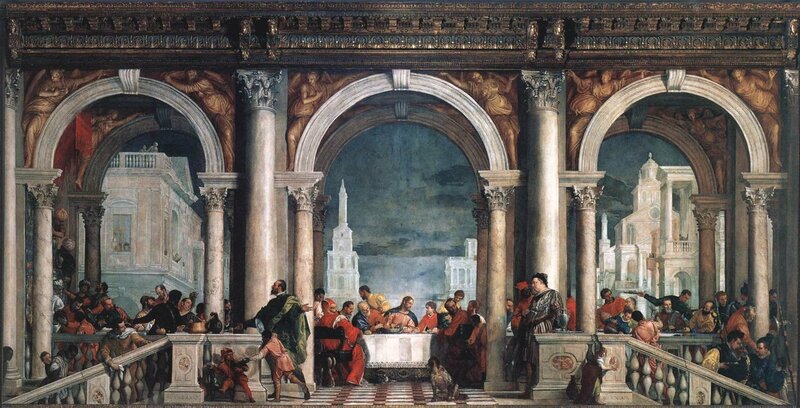 This painting by Veronese would replace Titian’s painting, The Last Supper, which had been lost in a fire in 1571. 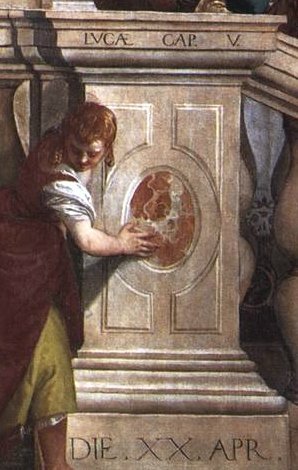 According to the writing on the base of the pillars, to the left and right in the foreground of the painting, the work was completed by Veronese on April 20th 1573. When I looked at some of the Veronese paintings at the National Gallery exhibition in my previous two blogs, I talked about the artist’s penchant for combining secular depictions in some of his religious works, such as his painting, Supper at Emmaus, and in today’s painting we can see that this theme was once again adopted, much to the horror of the Catholic Church. So let us look in more detail at this immensely impressive work. The Church’s displeasure of the completed work was not just that the depiction of the Last Supper, in the central background of the painting, seems almost to play a secondary and minor role in the work; it was that they were horrified by some of the numerous other characters who populated the work. Veronese’s inclusion of this assortment of characters into such a famous religious scene was looked upon by the Church as being irreverent, bordering on blasphemous. One has to remember that this period marked the beginning of the Counter Reformation which was the Catholic Church’s attempt to strongly and vociferously oppose the Protestant Reformation and to move towards a re-definition of good Catholic values. 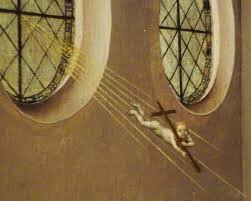 The Church was very wary about anything which could be perceived as mocking the Church and its values. This counter-reformation movement attempted to elevate the moral and educational standards of the clergy and by so doing enable it to win back areas endangered by Protestantism. 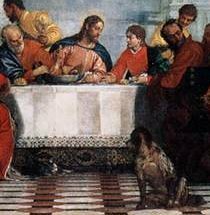 So when Veronese added a plethora of people, some of whom seemed to be drunk, as well as dogs, a cat, midgets, and Huns to the depiction of Christ at the Last Supper at the house of Simon, the elders of the Church were horrified. 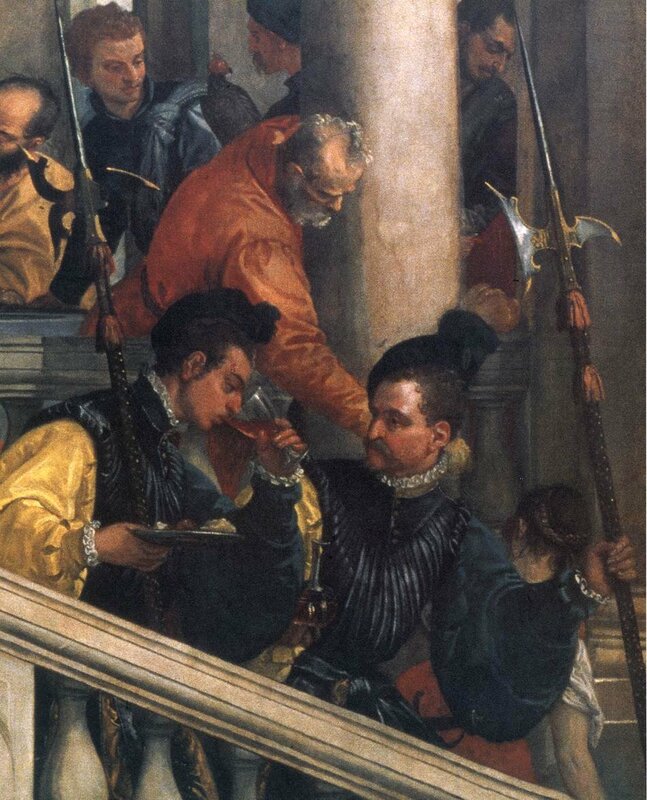 Veronese was summoned to appear before the Inquisition on July 18th 1573 which was sitting in the Chapel of S. Teodoro. The inclusion of the two Germans in the painting was considered by the inquisitors an even greater sin than the other inclusions the inquisitors questioned Veronese again as to their inclusion. In a desperate final attempt to justify the inclusion of all the extra people, both normal and strange, he pointed out that such elements that displeased the Inquisition, such as the dog, the dwarf, the blackamoors, the man with the nosebleed, who is seen holding a handkerchief at the left of the picture, were all in the foreground or the sides of the painting, and did not, in any way, form an incursion into the religious depiction of Christ at supper at the centre of the work. With a terrible sense of foreboding the questions came to an end and Veronese awaited his fate. 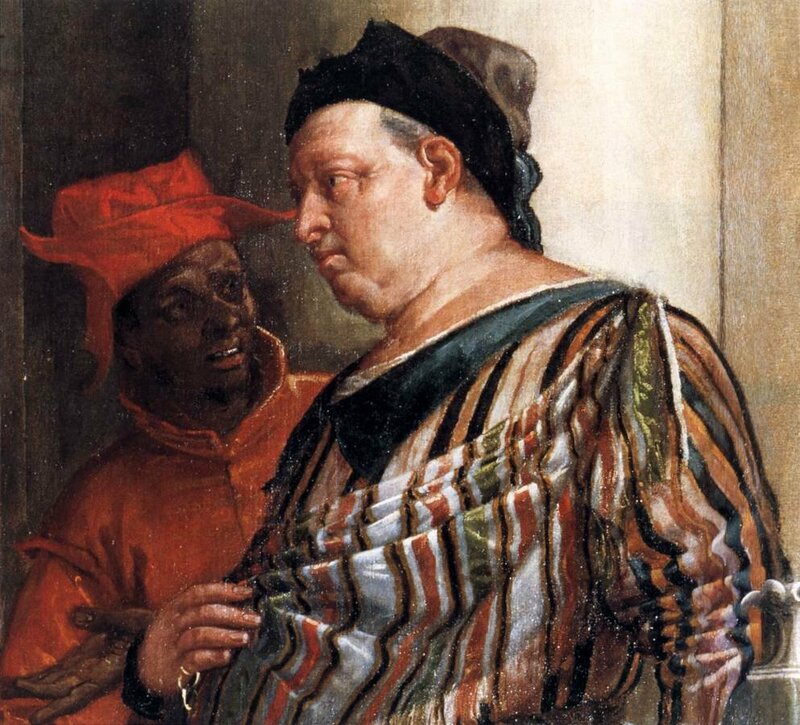 So, it was much to his surprise that at the end of the interrogation Veronese was told that he was a free man. However as the Inquisition could not accept his argument for adding what they termed “anti-conformist elements” he was given three months to correct the painting at his own expense. 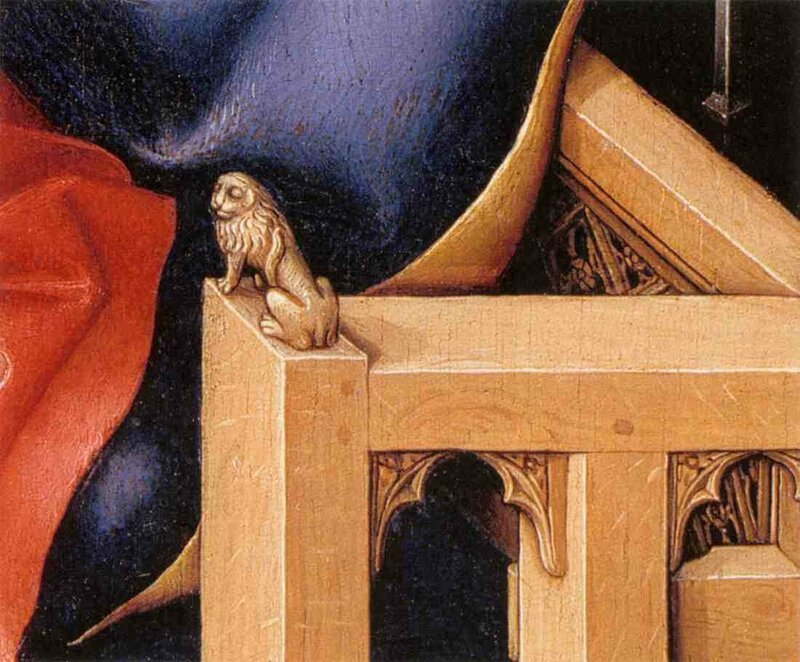 They required him to paint out the dog, and replace it with the Magdalene. He was also to expunge the German soldiers and it was all to be done within three months. Paolo Veronese, who had feared torture and even death because of his heretical depiction of the Last Supper, couldn’t believe his luck. So how had he managed to escape the full force of the Inquisition? Maybe the answer lay in the fact that the Inquisition had much reduced powers in Venice and the inquisitors knew that they could only threaten and not use the brutal methods of torture that was taking place in other countries such as Spain and Italy. They simply wanted to frighten Veronese in the hope that he would think twice before he again combined secularity with religious scenes. The Inquisition in Venice was also fully aware that every judgement they made was scrutinised by the Venetian Senate, who were ready to drastically curtail their powers, if they dared to take away the liberty of a Venetian subject and, of course, Paolo Veronese was one such subject. 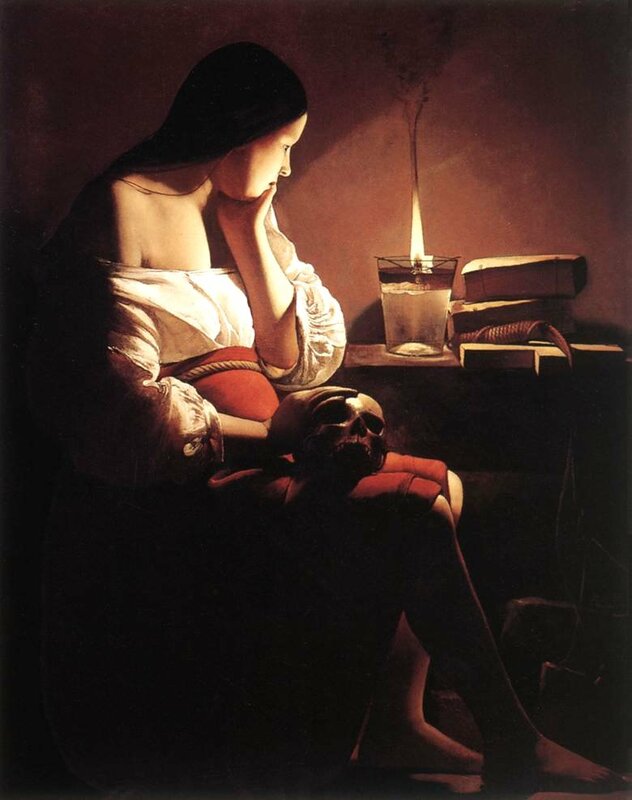 He then merely changed the title of the work from The Last Supper to Feast at the House of Levi and by doing so was able to retain the dog and removed the need for it to be replaced by a repentant Magdalene prostrating herself on the floor before Christ. Veronese’s decision not to make the changes pleased both the friars who loved the painting, and for the majority of Venetians who resented Rome’s inquisition. The painting remained in the refectory of the Basilica di Santi Giovanni e Paolo until Napoleon Bonaparte’s troops marched into Venice in 1797 and he ordered it be taken back to Paris. It was returned to Venice a decade later and remained in the church until 1815, at which time it was acquired by the Accademia Galleries in Venice, its current home. One final thought as to why Veronese would add so many people into a religious scene. A decade earlier, in 1563, he had completed a similar monumental religious commission for the monks, entitled the Wedding at Cana, which now hangs in the Louvre. It is interesting to note that it was the monks who had asked him to squeeze as many figures into their painting, as possible. This was however at a time when the Inquisition and the upholding of Counter-Reformation ideals had yet to reach Venice.